Occupy Wall Street – What About the Government? Ever since the news surfaced about the Occupy Wall Street protests in New York City, I’ve been trying to put my pulse on what exactly it is they want. In a recent blog post, I shared a list of demands taken from a member on their website – demands that were so irrational and crazy that they could never hope to be taken seriously. 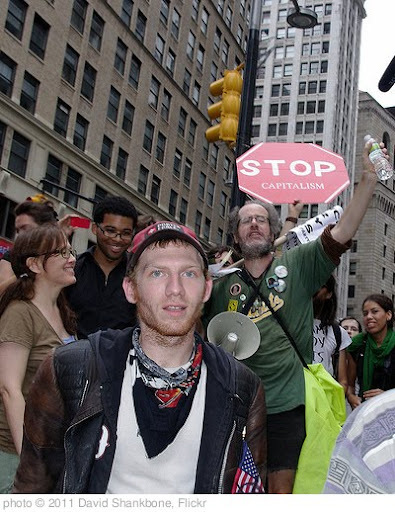 via Tea Party criticizes Occupy Wall Street actions – The York Daily Record. I could not have said it better myself. To those who are sitting in protest, screaming at Wall Street (all while not collecting a pay check themselves), perhaps you should look first to the government. The current administration is working hard to grow a society that encourages dependence on the government, does not support business growth and will ruin the values that make America what our founding fathers intended it to be. Now THAT is something to be concerned about.